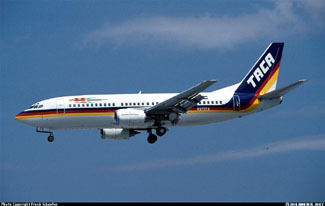 On May 24, 1988, a Boeing Model 737-300, N75356, owned by Polaris Aircraft Leasing Corp. and operated by TACA International Airlines as Flight 110 from San Salvador, El Salvador with a stop in Belize City, Belize, made a forced landing on a levee near New Orleans, Louisiana, following a dual engine flameout. The airplane encountered extremely severe weather at about approximately 16,500 feet during descent near New Orleans, Louisiana. There were no injuries reported from the 38 passengers and seven crew. The National Transportation Safety Board determined that the ingestion of large amounts of water and hail during a thunderstorm encounter caused the dual engine flameout.